If you are on a Self-Service plan, then Backtrace accepts payments via credit card. When you register for a plan, you will have the option to select the appropriate plan for your needs as well as enter in your billing information. 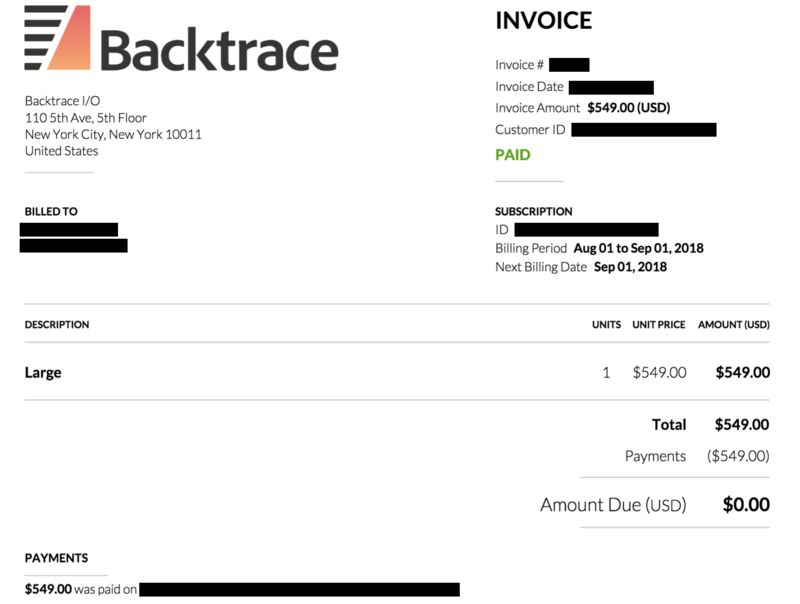 Once the transaction goes through, Backtrace will email the person who originally setup the Backtrace instance with an invoice that is flagged as "PAID". This also doubles as your sales receipt. By default, all billing- and subscription-related communication will be sent to the email address that originally registered for the Backtrace instance. This is usually the user that appears first when you go to Configure Organization - Users. If you are unsure, email support@backtrace.io and we will confirm for you. If you want the billing- and subscription-related communication to a different email address, email support@backtrace.io, and we will change it. Note: we can only send to a single email address at this time, although that email address can be a distribution list.